I love the Internet. For starters, I met the Web Goddess on an online divorce support group. Thanks to the Internet, I have been able to pontificate on this blog to an audience of literally dozens of people who otherwise would be bereft of my wisdom. But it’s still the Wild West on the World Wide Web (WWWWW). Web-enabled social media platforms such as Facebook lend themselves to scams that depend on social engineering as much as they do on TCP/IP. I think of myself as a reasonably sophisticated Internaut, but I got pwned this morning — before church, no less. 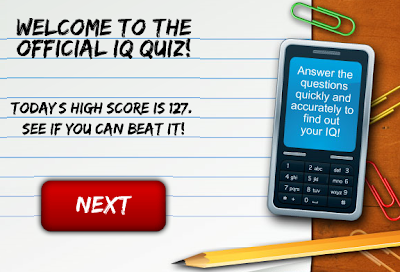 The Facebook message claimed that four of my friends had challenged me to an IQ test, with the smartest of them scoring 127. I was encouraged to click Continue to find out who they were and see if I could beat them. OK, Facebook friends — it’s on! The welcoming page at the IQ site included a screen (see top image) with the words “Answer the questions quickly and accurately to find out your IQ.” OK, speed counts, good to know — bring it! After racing through 10 multiple-choice questions (sample: of these four presidents, which was America’s 16th president? ), I get to the screen below. My heart’s pumping — I just know I aced all those questions! But now they want me to tell them my cell phone number… am I going to get junk calls? Oh well, I can always hang up, and at least they’re not asking for a credit card number. After I enter my cell number and click Next, I get a screen that tells me I have been sent a text message with a code number, and I have 30 seconds to enter the code number in a field on the web page. Crikey, my cell’s in the other room, the webpage is counting down the seconds, and I’m not sure how to retrieve a text message, I rarely use that service. I get the code number entered with about four seconds to spare… which leads to a screen telling me I have to accept the Terms and Conditions. Damn! I’m out of time! But maybe it will still work a few seconds late. I select the Terms and Conditions approval box and click Next. The next screen tells me to select the special ringtones I have ordered… and I start to have a sinking feeling in the pit of my stomach. I hit the back button to get to the page where I entered my cell phone number, and I see the virtually camouflaged reference (in the calculator screen in the picture above) to a $9.99 per month subscription. In small type at the very bottom (click the image to see a full-size version), there are five nondescript links, the fourth of which is the Terms and Conditions I didn’t read because I was running out of time. The Terms and Conditions are a true work of art. (They were in a pop-up and I don’t know a way to link directly, but I’ve captured the complete text just in case.) In addition to telling me that my high IQ will now cost me 10 bucks a month until I cancel, the term sheet contains this cheeky statement: “YOU AGREE TO REVIEW THIS AGREEMENT FROM TIME TO TIME AND AGREE THAT ANY SUBSEQUENT ACCESS TO OR USE BY YOU OF THE SERVICES FOLLOWING CHANGES TO THE AGREEMENT SHALL CONSTITUTE YOUR ACCEPTANCE OF ALL SUCH CHANGES.” In other words, if they change the price to $10 a minute, it’s on me to opt out — and if I use the ringtone in the meantime, I’m hosed. So after all my rushing, I ended up spending 28 minutes in voice-response hell with Verizon, before I got a human to tell me that I can cancel the ringtone “service” and I can dispute any charges that may get applied. I spent the 28 minutes rethinking my arrogant attitude toward the clients of Ponzi artist Bernie Madoff — clients who, I recently opined, should have known better. I’m tempted to say “shame on Verizon” as well, but the ability to charge goods and services to your cell phone is at least potentially useful, and the nice Verizon lady assured me I would lose no money over this. Even though I “agreed” to the Terms and Conditions. But here are other candidates for the IQ Test Hall of Shame: The aptly named Shadylizard.com, a ringtones peddler; Media Breakaway LLC, which according to the Terms and Conditions runs Shadylizard.com; quizyou.net, the site that hosts the phony quiz; and the “service” providers used by Media Breakaway to deliver ringtones: Flycell, Ringaza, Jamster and SendMe Mobile. Media Breakaway LLC, according to its Flashy website, is based in Westminster, Colorado, and offers “performance-based marketing solutions for our business partners.” If you have any comments or suggestions about their “solutions,” their phone number is 303-464-8164. The CEO, Scott Richter, can be reached at scott@mediabreakaway.com. This entry was posted in Uncategorized and tagged Facebook, Social Media, Web Goddess by Kirk Petersen. Bookmark the permalink. Pauly, the irony of the fact that it was an IQ test was not lost on me. Uugh. That’s disgusting. I know, I’ve been through (partway through) similar marketing hooks like that before. Ironic that it preys upon you by avoiding one’s intellectual faculties just as it happened as a result of “IQ” ads. (as was just commented on above). As soon as I see something like this that isn’t fully transparent and the link isn’t taking me to where it was supposed to go, I tend to drop it. I’m not much of a Facebook fan anymore either, though I was always a bit suspicious of it to begin with. Thanks for alerting us to this, Kirk. I nearly clicked on the link today. Glad I read this first! Scummy marketing ploys don’t paint a very rosy picture of the marketers, do they? I blew it off when they asked me for my cell phone number. Besides, the questions weren’t that hard. ollie, that’s obviously what I’ll do next time — I didn’t make the connection that if I give them my cell number and enter a code accepting terms and conditions, that something could be charged to my account. Between that and the hurry hurry hurry setup, I got taken in. Lori, MoneyEnergy, I had hoped that Facebook would find or respond to my complaint in some way, but the IQ test is still there. I’m reluctant to start a campaign against it on FB because I like the service, and I have heard of people getting accounts canceled. …AND THEY STILL SOMEHOW SIGNED ME UP AND SENT ME A WELCOME TEXT and I don't know how to get out of it. How do you unsubscribe to something you NEVER subscribed to? I was on the fence about facebook to begin with, I just recently started actively using mine and dabbling around with the vast array of apps they had. 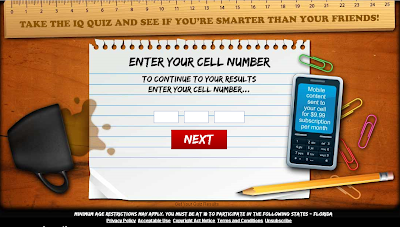 Needless to say, here I am, on late night when I should probably be in bed, and I got burned by this so-called IQ Test. It goes without saying that I am done using facebook and it’s pretty apparent why we’re in this economic crisis. Not only do these big companies take any and every measure possible to screw over the working class; not even something as seemingly harmless as facebook is above the trickery of screwing people over using underhanded tactics. I know and understand most people might, in its defense, say things such as: “Well you should have read the fine print.” Which commonly, I would agree with. However, that being said, again, I return to what I previously mentioned: Why would I think facebook to advocate such a thing and actively advertise for it? Well, enjoy the $20 or so that you’ll get out of me; cause I’ll never use facebook again. I hope even those of you that haven’t been scammed won’t continue supporting this crap by being a member. But that’s wishful thinking. Once you "agree" to this scam, have any of you found a way to unsubscribe to stop the recurring bill (aside from calling your carrier)? I've been searching for this, and have yet to find it.